A great logo design carries the core principles of an organization. When you look at brands like Coca-Cola, FedEx or Ikea, it’s easy to notice that consumers have created an emotional attachment with their logos. Iconic logos stand out, they’re instantly recognizable. Now we get it, your company isn’t as big as Coca-Cola. That doesn’t mean you can get away with looking sub-par. Even the smallest business can get off to a good start by having a distinct, professionally-made logo. A great logo is simple – a clean design is more recognizable and less confusing. It also is memorable – clever or different from the rest. Timelessness is another important factor – will the logo be relevant in 15, 30 years? Also, is it going to look good on different media? And most importantly: will it resonate well with your target audience? In the end, a logo solves a problem. That problem is getting across the message and values of the company it stands for. A logo adds value to the company and elevates it in the market. With that said, how do you create a unique and memorable logo? Why, using the logo design process, of course! Here are the nine steps we take to design logos for our clients. The designer and client have a meaningful conversation about the client’s goals and general marketing strategy the logo is part of. Deliverables (the final files that the client receives) are defined. In this time, the designer may or may not consume one an a half cups of coffee. The first part of the logo design process involves a discussion with the client about the company’s services, goals, values, time scale, target market, competitors and visual aesthetic. We strive to gather as much relevant information from our client as possible over the phone, email, or in person. Answers to questions such as: What does your business do? What is its history? help us put the company into context and set the framework for our logo design options. Then we’ll ask: What is your goal for the logo? Here, clients might tell us something about their values, personality, tone, and way they do business. This will help us inject the message into the logo design. As far as personality goes, are they more masculine or feminine? Do they plan to attract a younger or more mature personality? Are they more playful or more serious? We want to learn what is appropriate to their clients. On top of this, we also want to learn about their competitors. Who are they? Is your company better positioned in the market than your competitors? How is your company different? These discussions can be more helpful for smaller companies that don’t know what exactly sets them apart from the competition. Have they defined a client persona? It’s also important for us to learn whether the company already has a visual aesthetic. If there’s an existing style guide (colors, fonts, etc.) established, we’ll determine if the same style should be carried into the new logo, or if the new logo should define a larger change in style. We may establish potential mood boards for extra inspiration during the brainstorming and sketching session. Another important matter is where the logo will appear and on what scale. Designing an airline company logo is a great example of specific logo application. Airline companies display their logo on the tail fin of the airplane, so the new logo design must fit well there. Depending on the project, we also ask clients to fill out a logo design questionnaire which covers the main points described above. Perhaps the most important part of the logo design process, the research phase consists of getting to know the company, the target market, the competition, and industry trends. At this stage, we’ll do the research on our own based on the information the client gave us. A client’s opinion of their own company only tells half the story. That’s why we look them up ourselves and try to get the bigger picture about their business. We first look into the existing business and try to see where their branding level is at. The client might have missed telling us some important aspects about their brand. We’ll try to discover as much as we can about their overall brand message and image to provide the best solution possible. Furthermore, we also research the company’s target audience. If the client said that that their target market is, for instance, millennial women, we’ll study their preferences. The logo should reflect and attract the correct demographic. Understanding their particular niche and current design trends in that industry is also wise. The message and tone of the logo can vary wildly from niche to niche. But is it better to go with the trend or completely against it? Learning about the client’s competitors on our own is also really important. We check out their main competition to see what they’re doing well and not so well. This investigation helps us create a distinct but niche-appropriate logo. With a good understanding of the market, the designer brainstorms & creates freestyle sketches that incorporate the brand name, values, niche and UVP (unique value proposition). This is where the fun starts. Our graphic designer lets his mind run free and doodles dozens of logo ideas before deciding on a few. Why sketch so many you ask? Because it’s part of the creative process. Not all doodles are golden, but until they don’t come out from imagination onto paper, you’ll never know. Sketching down rough drafts helps our designer approach the problem from all possible angles. We could also call this step “visual brainstorming”. Concepts and themes turn into pen-and-paper sketches that are later reexamined and curated. The keywords related to the company and its product or service are the main source of inspiration. Our designer also takes into account those visual ideas the client suggested us. Whether they’re icons, styles, or shapes, all will play a part in deciding the outcome of the logo designs. However, the designer doesn’t typically use colors at this stage; they’ll be used later on. Most of the time, our designer uses dotted paper to balance and align things properly. A logo can rely heavily on geometry, symmetry, proportion, and other visual aspects. A lucky handful of the best hand drawn logo sketches get turned into vector logos. Three versions or so emerge from tweaking and merging the initial designs. By the way, the “chosen few” are not usually the safe ones or the nicest looking ones. To distinguish a logo from the rest, it must look unique. Remember, the logo is what makes the client’s brand image stand out. Our designer turns the chosen hand-drawn sketches into digital logos using Adobe Illustrator, a vector-based drawing program. Illustrator allows designers to tinker and transform the logo concepts in any imaginable way. Since it’s not so easy to turn concepts into vector-based logos, this stage is the most time consuming. Each selected logo is digitally tweaked and adjusted until the designer feels it’s right. The font chosen for the logo type has to accurately represent the brand. The designer considers style, serif or sans serif options, font family and weight (thin / bold etc.). While some logos are just stylized words or text, called wordmarks, others are a mixture of text and graphics, or just graphics with no text, aka logomarks. We don’t recommend logomarks unless you’re a household name. Logomarks are most suitable for businesses that are already market giants with an established brand identity. Think of Apple or Nike. For wordmarks, the typeface (font) is extremely important as it sets the tone for the whole logo. Our graphic designer tests each logo with different fonts taking into consideration the company’s personality and tone. If there’s no perfect font available, our graphic designer can customize one. This adds a unique touch to the logo. Colors can be fresh, serious, playful, calming, energizing etc. The color choice must be based on the targeted clients’ preference and on the brand’s personality. The logo concepts come to life with the addition of colors. If the client approved a few color palettes, we will test them on the logo concepts. If not, we’ll choose the ones that are most in line with the client’s brand and the preferences of their client persona. Color is subjective, and we’ll present the logo to our client in different hues and tones. However, we’ll ensure that the logo also looks good in black and white shades. These monotone designs may be needed in different backgrounds of branding material. Finally! Three or four versions of a logo came to life, and they await being presented to the client. That requires formatting and text to explain the vision. Once we decide on three or so logo designs, we’ll export them to a secure PDF format and send them for review. The PDF format lets clients easily view them on screen or printed. We recommend clients to view them both in print and on their monitors. We usually add written descriptions beside logos to provide more context. At that point, we may also add the logos onto collateral such as business cards to help clients see what the logos might look like on their marketing materials. Not so fast! Even when a client likes the work, they still have some feedback and input. This results out into a few rounds of back-and-forth. Agreements of the designs vary from project to project. Sometimes, the client finds one logo concept to be perfect and it’s a win-win situation. But clients almost always want some remodeling to be made. We don’t take it personally! As professionals, it’s our job to take the client feedback and use it as an opportunity to get even better results. Most changes have to do with the color scheme or typeface. An entire redesign is the worst-case scenario, but this is very rarely the case. After adding the final touch, we’ll present the updated logo again to the client. Often there are many rounds of revisions before the client is happy with the final product. Once a designer and client are in agreement and a logo is chosen, it still needs to be exported to web and print formats. Before we export the final logo, we’ll decide with the client which file formats and layouts are needed. These file types will come in handy for various output material. We typically send clients these file types: AI for later edits (e.g., 10 years later when a small tweak becomes necessary), EPS / PDF for printing, JPEG for viewing and PNG for web use. We’ll also offer black and white versions of the final logo. The vector file format, such as EPS, allows you to scale the size of the logo with no loss of quality or sharpness. What that means is that the logo will look perfect on a business card AND on a billboard. A logo may appear as a simple image, but there’s a lot of thought and effort behind it. 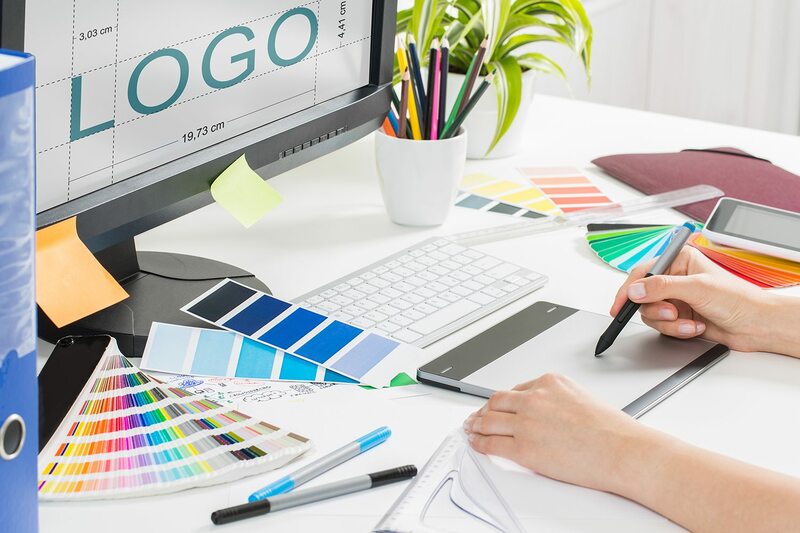 Creating a successful logo takes a lot of research, understanding of the industry and target audience, all while following a set of logo design rules. We’ve seen that the logo design process is a collaboration between the designer and the client. Taking the input from the client and transposing it to paper then to digital is a time-consuming process. As a valuable marketing asset for your company, a logo is worth the investment if it’s done by professionals. Crafting a unique and memorable logo takes experience and expertise. When done right, a logo will take your brand image to a different level. Need a logo for your company? Let’s talk! Graphic Design vs Web Design – What Are the Differences? How Important is a Great Logo for Your Business?